Genes-encoding marker proteins, which are easily assayable, are useful to monitor cell lineage, gene expression, or promoter activities. In gene-transfer technology such marker genes allow a direct and simple detection of successfully transduced cells. The detection of marker gene products such as β-galactosidase (β-gal), chloramphenicol acetyltransferase (CAT), alkaline phosphatase, or luciferase involves either cell fixation, which kills the cells or antibody-mediated detection, which is time consuming. Drug-resistance genes such as neomycin, puromycin, hygromycin, or zeocin allow a positive selection of transduced cells, but require days to weeks of growth in selective media. Moreover, these genes can change the growth characteristics of the transduced cells through terminal differentiation or can interfere with the expression of the gene of interest (1). Therefore, a marker gene system that provides timely, accurate, and nontoxic detection of successfully transduced living cells would be of great advantage. One interesting candidate gene that fulfills these requirements is the gene-encoding green fluorescent protein (GFP). It was originally isolated from the jellyfish Aquorea victoria. The GFP cDNA consists of 730 bp, which encode a 238 amino acid protein with a molecular weight of 27 kD (2). Wild-type GFP emits a vibrant green fluorescence upon exposure to blue light (450-490 nm). The signal is detectable by fluorescence microscopy and fluorescence-activated cell sorting (FACS) (3). Because the fluorescence of wild-type GFP after excitation is not strong enough for many applications, different variants of GFP have been developed. In one such variant, a point mutation was introduced at amino acid 65 (GFP-S65T) leading to a “red-shifted” excitation maximum with an approximately five-fold stronger fluorescent intensity (4). In a further variant, the “red-shifted” GFP was “humanized” by the introduction of numerous silent mutations that alter the codons to those more commonly used in human genes resulting in the improved translation of the gene (5-7). An additional point mutation at amino acid 64 in which phenylalanine was altered to leucine (F64L) further enhances gene expression (8). 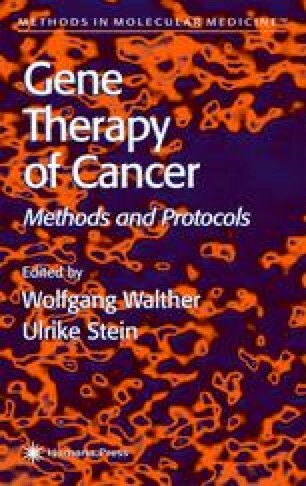 GFP has been expressed without cytotoxic effects in different organisms and is of special interest as a marker for monitoring cell lines and gene expression (3). The application of GFP in gene-transfer protocols allows the simple detection of transduced cells and offers the possibility for immediate enrichment of viable transduced cells by FACS (3,9,10). This is of great interest in gene transfer into poorly transducable cells, e.g., hematopoietic stem and progenitor cells.